Both the books I've reviewed in this post are ebooks: a new departure for me, as I don't actually possess an e-reader of any sort whatsoever, but the authors kindly sent me the books in a format I could read. Karen Bush has written a lot of non-fiction; The Problem Horse, The Principles of Teaching Riding and The Dog Expert to name just a few. She started her writing career with short stories for PONY Magazine, and then (there being a limit to the amount of short stories magazines can publish) moved to writing non fiction. She combines working as a freelance riding instructor with writing. 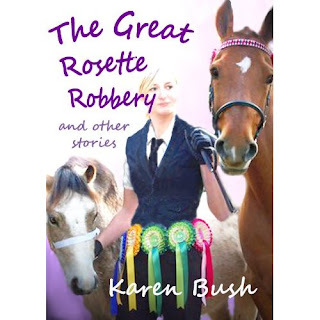 The Great Rosette Robbery is a collection of her short stories; there's a full length book imminent. My book is taking shape (at last - not helped by my decision to do a complete re-write of one section, hem hem). Frantic scribbling allied to my faithful winter friend, the chest infection has meant a failure on the blogging front, but I have been reading other people's. Firstly, here's Susanna Forrest on Totilas: money talked, but the horse wasn't listening. Look! Flowers! Seattle in Spring on Piccalli Pie. The reality of life in sub-zero Britain. More War Horse (I promise I will stop soon), but this pictorial review is too good not to share. Apologies if you've seen it elsewhere I've posted. Skip right on. Have great weekends, people. Must go back out and do more yard clearance now. I've reviewed several of Pippa's Tilly's Pony Tails series. I've liked them, but said that I feel Pippa is strongest when writing about practical matters. This book plays to Pippa's strengths. It's organised into three sections: About Horses, About Riding, and About Pippa. Each contains questions Pippa's been asked, and her answers. The questions vary between the real basics - Why is grooming necessary? to the more complex: "My horse is sometimes backward thinking. I can feel he is going to stop, but the more pressure I apply, the more he resists. What can I do to overcome this?" Another in my (very short) series of five minute, impermanent crafts. This is snow dog. He took about 5 minutes to do, and lasted about 5 minutes, being wrecked young in his life by a labrador not looking where it was going. This dog is entirely innocent. Thanks to Orion for sending me copies of these books. Regular readers will know that I was a fan of Victoria Eveleigh's books in their self-published guise. She's now been taken on by Orion, and the books have been re-issued. They have had a bit of a re-write; the technology has now been updated (still no mobile signal on bits of Exmoor though) and the narrative feels tighter than in the books' original incarnations. The illustrations have mostly gone, to be replaced by chapter headings by Chris Eveleigh. I do like the new look; the cover photographs were taken by someone who had been well briefed, and are refreshingly free of glamour and sparkle.